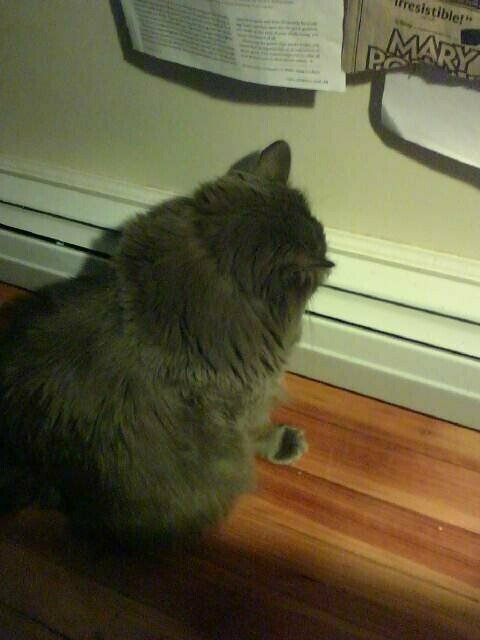 Yes, he’s staring at the radiator because that’s where evil lives, apparently. It’s disconcerting. Yes, I know it makes odd sounds when the heat comes on, but why does he sit *right* behind my chair and stare at the very same spot always. Is it because all of the other radiators throughout this place are putting out heat, but that spot — and only that one spot — radiates evil? Yes, this must be so. Or maybe writing about Memoirs of a Master Forger and all its demons is making me see things too… or hear them. Perhaps Kipper is one of Basement Cat's hellish minions…. LOL — he joined up while cruising the internet as I am certain he does while I'm away. Just wait until your new credit card bill comes in….what is that $876.95 for cat toys??? LOL — so he's just freaking me out to get me away from the computer so he can use it? Fiendish! Well, yes, but on a more prosaic level he wants you to have his back when he finally confronts that hissing WhatEverThing that keeps challenging and banging in there (I'm assuming a steam heat radiator). Sure bugs the hell out of Alice's cats, her house's. I suspect he will chicken out should it ever come to a confrontation. I had to slip a cooking tray under the water bowl while I figured out whether I had spilled it or if it were leaking (the latter, unfortunately) and Kipper with his usual groundhog-mode terror (crouching flat on the ground as he stared at the simple metal tray in horror). Ages before he would drink from it. One of my cats occasionally suspects his water dish of the same thing. Which is fine — better that than the litter box!